Cheltenham’s come a long way, coffee-wise, since I first visited in 2013. On Monday, I wrote about The Scandinavian Coffee Pod, which has, along with Studio Coffee Roasters, been leading the way since 2014, although today’s Coffee Spot, The Coffee Dispensary, is not far behind, having opened just over three years ago in October 2015. Like The Scandinavian Coffee Pod, it’s right in the centre of town, on Regent Street, by the Regent Arcade. There’s an impressive selection of coffee. Bristol’s Extract Coffee Roasters is the mainstay, supplying the house espresso (which changes every few months), while the weekly-changing guests provide multiple single-origins on both espresso and filter. The Coffee Dispensary wants nothing less than the best coffee from the best roasters: during my visit this included Bath’s Colonna Coffee and Round Hill Roastery plus Birmingham’s Quarter Horse Coffee Roasters. Filter coffee is usually available through V60, but the staff will also do Chemex, Aeropress or Kalita Wave, plus there’s batch-brew. All the coffee is available to buy in retail bags. Alternatively, there are ten teas, six hot chocolates and five chai lattes. If you’re hungry, there’s a small selection of sandwiches, plus cakes for those with a sweet tooth. The Coffee Dispensary is in the heart of Cheltenham, on the east side of Regent Street, occupying the ground floor of what looks like a row of Regency-era houses, sharing the building with, amongst other things, an upstairs nail bar and, in the basement, a Japanese restaurant (which accounts for the two tables outside on the pavement). The Coffee Dispensary is at the end of the terrace, with the entrance on the left, up four broad steps which lead to a long hallway. This is shared with the nail bar, which has its door at the back, while the entrance to The Coffee Dispensary is just to the right of that. In keeping with the feel of an old town house, The Coffee Dispensary occupies the two ground-floor rooms, the sitting room at the front and maybe a kitchen or parlour at the back, the two spaces joined by a wide opening in the centre of the party wall. The distinction continues to this day, with the front section given over to seating, while the back is almost exclusively the preserve of the large counter. The door opens on the left-hand side, towards the rear of the front section. The seating is arranged in three rows, front-to-back, leaving two broad corridors between them which align with the two sash windows in the front wall. A padded bench lines the left-hand wall, ending at the door, with three, small, round two-person tables, while the middle row has five, square two-person tables, the rear-most sitting right in the middle of the opening in the party wall. The third row is against the right-hand wall, where a pair of four-person tables flank the fireplace in the middle of the wall, in front of which is a small, two-person round table. Finally, there’s one last table, tucked away at the back on the right, between the party wall and the counter. This is the only seating in the rear section of The Coffee Dispensary, which is dominated by the counter, running almost the full width, illuminated by a single, square window in the back wall. The till is on the left, along with a selection of pastries, with the menu on the wall behind it. The three-group Sanremo Café Racer espresso machine, meanwhile, is in the middle, next to a single EK-30 grinder for the house espresso. Beyond this comes an EK-43 for filter coffee and the other espressos, while the right-hand wall has the list of current coffees. The left-hand wall, meanwhile, is home to the cakes, along with a set of retail shelves, selling retail bags and various bits of coffee-making kit. Each room has its own light fitting in the centre of the ceiling, from which The Coffee Dispensary has strung multiple light-bulbs on long cords, supplemented by various spotlights and other light-fittings. During my visit, there were three single-origins on espresso (Extract plus two from Colonna Coffee) and three on filter (Extract, Round Hill and Quarter Horse). 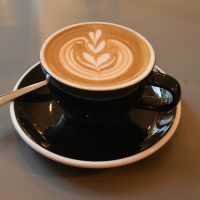 For my first coffee of the day, I went for a flat white, following the barista’s recommendation of which went best in milk, selecting Extract’s seasonal Strongman/woman espresso. This is a pretty fruity, punchy coffee that goes surprisingly well in milk, the two components not exactly in harmony, but neither did they clash, combining to producing a rich, biscuity drink. I also tried a sample of the El Aguila, a washed Colombian from Round Hill which was on batch-brew (this changes daily). For a washed coffee, it had plenty of body and was another fruity, punchy coffee that made for a lovely filter. December 2018: The Coffee Dispensary was a runner-up for the 2018 Coffee Spot with the Best Lighting Award. This entry was posted in Cafes, Cake, Cheltenham, Laptop Friendly, Retailers, Sandwiches and tagged Extract, include, Multi-roaster, Round Hill by Brian Williams. Bookmark the permalink.